I love a good story and especially a true story of people who beat the odds, but I get tired of ones that are so sad I don’t even want to finish it. I can only read about so many victims. I want survivors and adventure in the face of danger or personal growth. 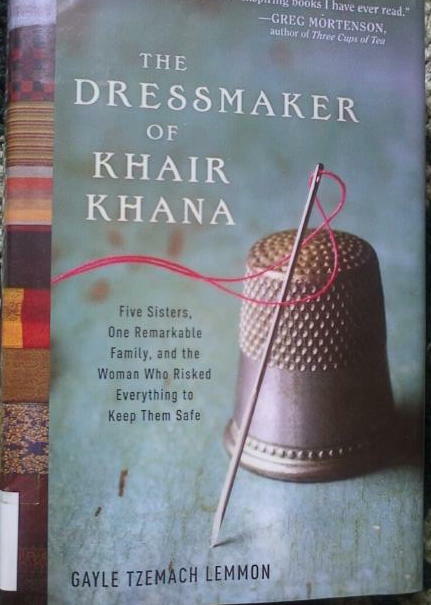 “The Dressmaker of Khair Khana” by Gayle Tzemach Lemmon, is not a story of victims. It is a inspiring tale weaving together the power of family, friendship, neighbors, luck, determination and entrepreneurship. All of this happened in the midst of a war. As someone who has never lived in a war zone I cannot begin to relate to hardships that must bring. I LOVED this book. Set in Afghanistan during their latest war, the dressmaker is a young women who was determined to provide for her family and keep her sisters from the boredom of no longer being able to go to school or leave their home. Her father and mother were living in another area of the country and the streets were dangerous with no thanks to war. She worried for her family and was at the same time bored. Her sisters and her were not allowed to leave home without a chaperon, and even then were threatened when they went out. So she and her sisters (including a brother who was a stellar beader) started sewing and selling dresses and pant suits to local tailors. She eventually expanded enough to operate a school in her home to teach young women how to be tailors. A real perk about this book is the men who were supportive and lent a hand. From her brothers who accompanied her as she walked the city and also assisted with beading to the neighbors who kept her school secret and the tailors who supported her work, there is no lack of men who were not just in the story as oppressors and warriors. This book is just the write length and is an enjoyable read. It is also a good business book if you are considering the path of self employed life. What is your favorite book about overcoming the odds to succeeed? Previous postWhat Is Your Intent? Thank you. I appreciate the reblog. This is a book that needs to be read around the world. I love holding a book in my hands and yes the smell as well. I really love the old books that didn’t have a glossy cover, but were a thick textured paper stock instead. I have read a few ebooks and my eyes just start to glaze over. Maybe it is because of all the time I already spend staring at a screen. Staring at paper is a vacation.